Using a pair of chain-nose pliers, round-nose pliers and flush-cutters form a wrapped loop on the straight end of the wire creating an acrylic drop. Using bent-nose pliers gently form the bead cap around the sides of the flat oval. Repeat Steps 1 and 2 to create a second acrylic drop. Open one 4mm jumpring and pass it through the loop on the ring portion of the toggle clasp. Close the jumpring. Repeat to add a second jumpring for double jumprings. Repeat to add double jumprings to the loop on the bar portion of the toggle clasp. Using flush-cutters, cut two 16-inch length of beading wire. String one 16-inch length of beading wire one gold-filled 2x2mm crimp bead and the wrapped loop from one acrylic drop. Pass the beading wire back through the crimp bead. Pull the beading wire so the crimp rests snug against the loop leaving approximately 1/4 inch of beading wire on the end. Place a small amount of adhesive (Loctite®) inside the crimp (optional). Using crimping pliers crimp the crimp bead. Using flush-cutters trim the excess from the short end of the beading wire. Place one gold-plated 3mm crimp cover over the crimp bead then gently close it. 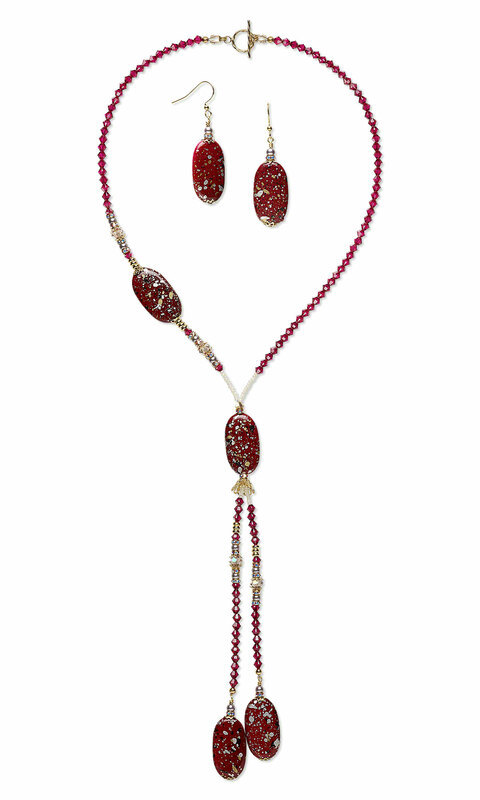 String onto the beading wire eight Swarovski ruby 4mm bicones. Continue to string five Swarovski ruby 4mm bicones and seven Czech glass pearl white #11 seed beads. Place a Bead Stopper™ on the end of the beading wire. Repeat Step 4 to begin stringing the second strand of beading wire. String onto the second strand thirteen Swarovski ruby 4mm bicones. Repeat the stringing sequence in Step 6 one time. Continue to string three Swarovski ruby 4mm bicones and five Czech glass pearl white #11 seed beads. Remove the Bead Stopper from the first strand and string onto both strands of beading wire one gold-filled 2x2mm crimp bead. Crimp the crimp bead. Place a Bead Stopper on second strand of beading wire. Pass the beading wire back through the crimp bead. Pull the beading wire so the crimp rests snug against the Accu-Guard leaving approximately 1/4 inch of beading wire on the end. Place a small amount of adhesive (Loctite) inside the crimp (optional). Remove the Bead Stopper from the second strand and string twelve Czech glass pearl white #11 seed beads and one Swarovski ruby 4mm bicone. Repeat the stringing sequence in Step 6 in the opposite direction. Repeat Step 16 to secure the strand. Using a pair of chain-nose pliers open the loop on one gold-plated fishhook earwire. Pass the loop through the wrapped loop on the acrylic drop. Close the earwire loop.